The celebrity chef's remarks about the quality of Chinese-American restaurants, such as P.F. Chang's, were criticized for being culturally insensitive. The apology follows Zimmern's interview with Fast Company, published last week, where he discussed the opening of his latest restaurant Lucky Cricket, a Chinese restaurant that includes a Tiki bar, at a mall in a Minnesota suburb. The goal, he said, was to introduce Midwesterners to "hot chili oil, introduce them to a hand-cut noodle, and introduce them to a real roast duck," and to open 200 of those restaurants across middle America. “I think I'm saving the souls of all the people from having to dine at these horses--- restaurants masquerading as Chinese food that are in the Midwest,” he said. Zimmern's remarks were widely criticized for being culturally insensitive. "The Midwest’s 'horses--- restaurants' are what paved the way for Zimmern’s venture and more broadly, Chinese cuisine in America," Washington Post contributor Ruth Tam wrote in response. "Chinese American food may have originated in the nation’s coastal cities, where immigrants first opened shop, but I’d argue that this cuisine’s ability to thrive in the Midwest with fewer Asian patrons cemented its lasting role in this country. These 'horses---' restaurants may not clear Zimmern’s bar for authenticity, but despite adversity, they created a time-tested model for immigrant food and helped make Chinese food not only ubiquitous, but part of American identity." He also suggested that P.F. Chang's was a “ripoff” because it was owned by the son — “a rich, American kid on the inside” — of culinary figure Cecilia Chang, who is credited with introducing America to traditional Chinese cuisine. "With one glib comment, Zimmern basically erases [Philip] Chiang’s experience of race in America because he was from a rich family," Dixler Canavan wrote. "Calling Chiang’s cultural purity into question in order to give his own work on Lucky Cricket a pass is deeply misguided, if not outrageously offensive." In his apology, Zimmern said he did not intend to portray himself as the expert of quality Chinese or Chinese-American food or culture, and that some of what he said was taken out of context. He noted that many people in Minnesota only know the Chinese food found at airports and malls. CORRECTION (Nov. 28, 2018, 10:26 a.m. 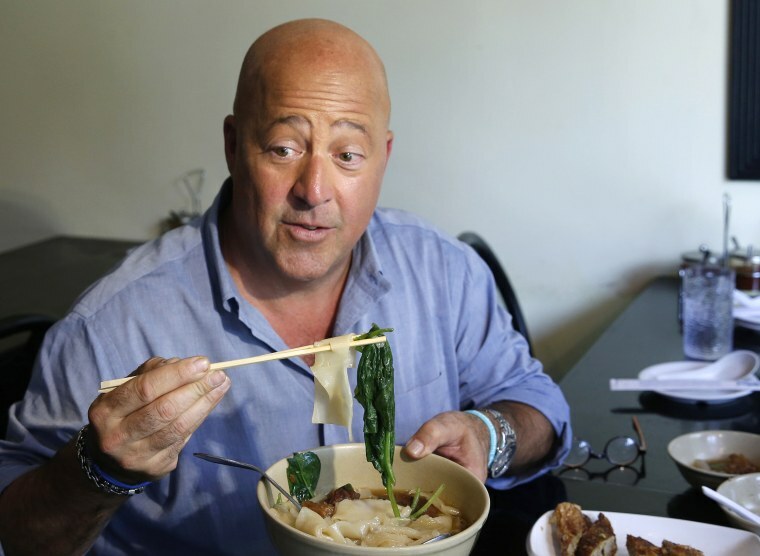 ET): An earlier version of a photo caption in this article misspelled the name of a TV show hosted by Andrew Zimmern. The show is "Bizarre Foods," not "Bizzare Foods."